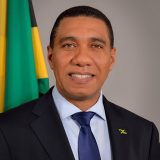 The Most Honourable Andrew Michael Holness was first elected as Member of Parliament (MP) to represent the Constituency of West Central St. Andrew in 1997, at the age of 25. Now in his fourth consecutive term as MP, Mr. Holness became Jamaica’s ninth Prime Minister after the Jamaica Labour Party defeated the People’s National Party at the polls on February 25, 2016. Mr. Holness has pledged to build real partnerships with the Private Sector, Civil Society, the Diaspora, the Opposition and International Partners in order to achieve the vision of shared prosperity for all Jamaicans through inclusive economic growth and meaningful job creation. Mr. Holness first served as Head of Government from October 2011 to January 2012 having succeeded former Prime Minister the Honourable Bruce Golding. Prior to assuming the awesome responsibility of leading the nation, Mr. Holness has worked steadily at various levels of the political and governance systems. He has focused on several key portfolios areas including: social welfare, community development, housing and education. However, it is in the area of Education that Mr. Holness found his passion and distinguished himself both as the Opposition Spokesperson on Education and in the Cabinet as Minister of Education. He brought national attention and focus to literacy and has instituted several programmes to place Jamaica on the path to universal literacy at the primary level. Under his watch, Jamaica saw the introduction of the Career Advancement Programme (CAP) – a post-secondary technical and vocational training programme for unattached youth. However, some of Mr. Holness’ more fundamental reforms to the Education System include: the establishment of institutions such as the Jamaica Teaching Council, the National Education Trust, the National Education Inspectorate, National College for Education Leadership, the Centres of Excellence Programme and the Alternative Secondary Transition Education Programme (ASTEP) designed to support students falling behind in general education. With a Master of Science in Development Studies and a Bachelor of Science in Management Studies from the University of the West Indies (Mona Campus), Mr. Holness brings a vibrant, pragmatic energy to the transformation of Public Sector Administration and to making Government more agile and responsive. The focus of his Government is to grow the economy, create jobs and improve the well-being of the Jamaican people. Mr. Holness was born to working class parents on July 22, 1972 in Spanish Town, St. Catherine. At 43, Mr. Holness is Jamaica’s youngest Prime Minister to date and the first born after National Independence. He is married to Juliet, who is a first term Member of Parliament for East Rural St Andrew, a Chartered Accountant and Real Estate Developer. They have two sons, Adam 13 and Matthew 11. Mr. Holness enjoys a game of chess, jogging, cycling and a round of table tennis when he can find players. Check out the incredible speaker line-up to see who will be joining The Most Honourable Andrew Michael.